More than a simple transfer, this tour will offer a deeper insight into the local region. See the area with the assistance of the locals! Your narrated tour will start as soon as you get off the ship! Learn more about the local history, flora, and fauna as you travel north to Alaska's largest city, Anchorage. You will take a City Tour that includes both the history of Anchorage as well as life in this modern, American city. There will be time on your own for shopping and lunch in the downtown area. After lunch you will be transferred to the Anchorage Museum of History and Art. You will be at your leisure to explore this world-class facility. The tour ends with an included transfer to the Anchorage Airport. Please note: Bring layered clothing and a light rain poncho. Wear close-toed, comfortable shoes. This tour is available for those who have flights at 5 p.m. or later and is wheelchair accessible. Windstar Signature Expeditions are operated by Windstar Cruises directly from the ship. Windstar Cruises has partnered with expert Expedition Voyage Consultants to provide insight, education and commentary on the stunning scenery of the Alaskan Wilderness. Kayaking around Kenai Fjords National Park area provides the opportunity to kayak by tidewater glaciers that flow from the Harding Ice Field, possibly seeing a glacier calving and kayaking among ice that has calved. Taking in the spectacular scenery of the area you may see harbor seals, black bears on the beach, bald eagles and puffins. Please note: You can conveniently change in your suite. Dress according to the prevailing weather condition; you will be provided with a life jacket. Wildlife sightings are not guaranteed and tour operation is weather dependent. Expedition Voyage Consultants may include geologists, marine biologists, botanists, and glaciologists. You will have about 2 hours of paddling. •	The departure times for the Signature Expedition tours are subject to change due to the nature of these excursions. Destination Services will notify you about your tour departure time. •	All kayaks used for the Signature Expedition tours are 2-person tandem kayaks. Windstar Signature Expeditions are operated by Windstar Cruises directly from the ship. Windstar Cruises has partnered with expert Expedition Voyage Consultants who will operate the Zodiac boats while also providing insight, education and commentary on the stunning scenery of the Alaskan Wilderness. On your Zodiac tour around Kenai Fjords National Park area you will ride by tidewater glaciers that flow from the Harding Ice Field, possibly seeing a glacier calving and riding among ice that has calved. Taking in the spectacular scenery of the area you may see harbor seals, black bears on the beach, bald eagles and puffins. Please note: You can conveniently change in your suite. Dress according to the prevailing weather conditions; you will be provided with a life jacket. Wildlife sightings are not guaranteed and tour operation is weather dependent. Expedition Voyage Consultants may include geologists, marine biologists, botanists, and glaciologists. Please inform the Destination Services team if you are travelling in a group of 4-6 people and booked on the same expedition as the zodiac boat tours can only accommodate 6 guests at a time. Explore ~Stretch ~ Twist ~ and pull your very own colorful Venetian glass cane, ~ one of the oldest methods of working in glass! After your hands-on experience in the glass studio, you will explore a beautiful part of the Sitka Community that most do not get to see – local art and traditions. Local glass artist Michelle Barker will welcome you into her studio. Although she works in many methods of glass, she has a love for the unique history and techniques developed centuries ago in Italy. On this tour you will watch as these beautiful glass canes are made, and have the opportunity to gently stretch, twist, and pull your own vibrant cane. Sitka has a long history of cultivating the fine arts. In the early 1800’s Sitka was home to the first opera house, first performing arts theater, and had the first piano on the west coast. With many famous artists such as E.W. Merrill – a well-known glass plate photographer who lived in Sitka from 1819 through the 1840’s – to present day artists, your guide will explore all Sitka has to offer for art enthusiasts. Walk the city, the galleries, and see local artwork such as silver and wood carving, ceramics, regalia beading, kiln formed glass, ceramics, and pulling Venetian glass canes … maybe even try your hand at one. This tour will include a number of galleries and a hands-on art demonstration. You will meet several local artists and have the opportunity to visit with each of them, receive a wealth of information on the many different forms traditional and local artwork. Learn why this unique city in Southeast Alaska has grown into the beautiful artist community that it is today. You will have opportunity to purchase locally made and custom made art pieces on this tour as well as make something beautiful of your own! Please note: All guests will be provided with safety glasses, leather aprons, and gloves while in the glass studio. Wear comfortable clothes and shoes. This unique Alaska excursion explores the historical highlights of this former "Russian" capital city and includes a wildlife tour through the Alaska Raptor Center. The Bald Eagle Center operates with bird care professionals assisted by volunteers to rescue birds, provide them with rehabilitative care and hopefully release them back into the wild. After your introduction to the center, a presentation with one of the Center's educational birds will take place. Time will be available to view the flight center, clinic window, outside deck habitat areas and gift shop. Next, you'll visit the Sitka National Historical Park, where the 1804 "Battle of Alaska," was fought. The park hosts totem-lined trails, cultural exhibits and carving rooms where native Alaskan artisans demonstrate their totemic art form. Walk the nature trail, view cultural exhibits and video presentations, or talk with local native artists about their cultural art form. The final stop will be visiting the Fortress of the Bears, which will allow you to get within 25 feet of Alaska’s brown and black bears in a naturalized setting. You will enjoy observing the bears from a covered viewing platform and interact with an experienced naturalist. Please note: Wear comfortable walking shoes, layered clothing and bring a light rain jacket, ID,you’re your camera. The order of sites visited may be reversed. For guests who love the outdoors and are looking for a little exercise, join the Sitka Bike & Hike. Ride along the coastal road and hike in the temperate rainforest while visiting with local guides who are well versed in the local environment and cultural traditions. This guided tour of the south end of the Sitka road system will be geared for those who want to get outside, see a part of Sitka that visitors rarely experience, get some exercise, and enjoy the fresh clean air. The tour will focus on the local history, lore, and fauna. The route will pass closely by the Pacific Ocean and will overlook stunning Silver Bay. You will also hike to Thimbleberry Lake, crossing an impressive waterfall and enjoy Whale Park (via steep stairways). Expect a gently rolling 4-mile ride and 2 miles of hiking. Tour operates rain or shine. Please note: All riders will be required to wear a provided helmet. Wear comfortable clothes and shoes. Storage is provided for items not needed for the tour. Rain gear, pants and jackets are provided when needed and the tour operates rain or shine. Minimum height is 4'10" and minimum age is 10 years. Discover Alaska's abundant natural beauty and wildlife during this award-winning cruise through Sitka Sound, one of the world's most beautiful coastal environments. Search for local marine life on this half-day, scenic excursion. Depart the pier in your waterjet-driven tour vessel which has been specially designed to navigate Southeast Alaska's narrow island passages and bays, permitting spectacular wildlife viewing at close range. The vessel features a warm and comfortable cabin with indoor seating, large windows, a snack bar and restrooms. Or you may opt to visit the upper observation deck for unparalleled photo opportunities, and to experience the surroundings. Be on the lookout for sea otters, whales, sea lions, porpoise, harbor seals, black-tailed deer, bald eagles, and a variety of wildlife species during this jet-boat excursion. Observe and photograph sea otters as you learn about their recovery following near extinction at the hands of Russian fur hunters in the 1800s. Your onboard naturalist guide will offer commentary about this remarkable ecosystem throughout the tour. Your captain will vary the route to find the best wildlife viewing opportunities and guarantees you will see an otter, a whale, or a bear on the sea portion of your excursion. If not, you will receive $100 cash refund at the end of the voyage. Please note: Dress in layers, waterproof jacket (if guests would like to go outside), camera, warm hat, gloves. The ultimate Alaska experience begins as soon as you board our Alaskan-built expedition vessel in Sitka. While you settle into the comfortable cabin, your knowledgeable captain and crew will provide a safety briefing and orientation. Once underway, feel free to move about the vessel, including the spacious outside viewing deck. An onboard naturalist will provide narration regarding the remarkable ecosystem of the area and point out places of interest and wildlife throughout the voyage. Sea otters, whales, harbor seals, brown bears, Sitka black-tailed deer, bald eagles, and a variety of marine birds are all commonly seen in the tour area. Your captain has the local knowledge and experience to deliver the best possible viewing experience on any given day throughout the season. At Fin Island Lodge, you’ll have the opportunity to indulge in a delicious Alaska feast! Alaska king crab, wild salmon, prime rib, homemade side dishes, and dessert are all-inclusive with the tour. In addition, coffee, tea, cocoa, lemonade, and water are complimentary. Soft drinks are available for purchase. A breakfast twist on our signature Fin Island feast is featured for guests arriving before 10 a.m. Vegan and gluten free options are available, regardless of tour time. After the meal, you may beachcomb, explore the beautiful grounds of the exclusive island, or relax next to the cozy beach fire. When the adventure concludes, your vessel will await to provide the short cruise back to Sitka. Please note: Dress in layers, wear a waterproof jacket (if you would like to go outside), good walking shoes, and bring your camera, warm hat, and gloves. What’s on your Alaskan bucket list? Flying high above breathtaking views of Alaskan landscapes? Walking on the famed Mendenhall Glacier? Zipping through the snow on a sled pulled by a team of Alaskan huskies? This tour offers all this and more. You begin at a comfortable heli-base where you will be outfitted in glacier boots and given a safety briefing by the friendly tour attendants. From here you will board state-of-the-art helicopters and be whisked away to begin you dog sledding adventure. The highly trained pilots will narrate the scenic helicopter ride on your way to the main attraction - the mighty Mendenhall Glacier. As you touch down at the dog mushing camp, you will be greeted by professional dog mushers and their energetic companions, the Alaskan huskies! Experience the unique thrill as these athletes pull you through the snow that blankets the Mendenhall Glacier. Take turns directing the dogs with your musher and relaxing in the sled. After your exhilarating sledding experience, you will have time to cuddle with puppies and chat with your dog musher before boarding your helicopter to return to base and check off that bucket list activity. Please note: No bags are allowed on tour. All bags can be locked in lockers prior to boarding the helicopter. Guests should come prepared with warm clothing, including waterproof outer shell, gloves, hat, sunglasses, camera, and binoculars. Comfortable walking shoes are recommended. Prohibited items - iPads or any type of tablets, selfie-sticks or any other extending electronic devices. This truly Alaskan adventure offers the rare opportunity to mush your own dog sled team across a snow-capped glacier. Learn the tricks of the trade from seasoned veterans of the legendary Alaskan Iditarod Sled Dog Race. Master the all-important commands of Hike! Gee! and Haw! Experience the unique thrill of zipping across a pristine glacier with a team of friendly huskies while enjoying the fresh mountain air and scenic vistas. This exclusive dog sled camp is located on the picturesque middle branch of the Norris Glacier. On your way there, you will be amazed by a wondrous heli-flightseeing trip over the vast Juneau Icefield. View spectacular icefalls, rock formations, and untamed wilderness. Accessible only by air, this region is filled with lush forest, glassy alpine lakes, jagged mountain peeks and awe-inspiring glaciers. Enjoy approximately 30-35 minutes of flight time and one hour at dog camp base. Please note: Dress in layers and bring a waterproof outer layer. Due to flight weight and balance limitations, as well as passenger safety and comfort, passengers weighing 250 pounds or more will be charged an additional half fare to reserve adequate space on board the helicopter. Take off into the wild blue yonder with a flightseeing plan customized by the pilot. Two different landings among the 36 named glaciers is an adventure not to be missed. Marvel at alpine lakes, icefalls hanging from sheer cliffs, and some of the most remote peaks on the Juneau Icefield. This incomparable journey of discovery is a once-in-a-lifetime experience that you help create. The itinerary is flexible and your pilot is free to create the best possible tour under the current weather and glacier conditions. After arriving at the heliport, you’ll receive a safety briefing and a general orientation on your day's flightseeing trip. You'll also receive some of the gear you will need to wear as you venture out onto the glaciers. Once you're in the air, you and your pilot will choose two different landings among the most remote peaks and glaciers in the Juneau Icefield like Herbert, Taku, Norris, Gilkey, Hole in the Wall or Mendenhall. As you walk out onto the ice, your pilot will also act as your guide, and you will have the opportunity to explore and take photographs of this stunning, untouched landscape, before heading back to port. Keep an eye on the mountain peaks for wildlife including bears, deer, and mountain goats while descending towards your landing sites on the glaciers. Enjoy breathtaking views of spectacular rock formations of the mountain peaks, high alpine lakes, "icefalls" hanging from sheer cliffs and some of the most remote peaks and glaciers in the Juneau Icefield. Please note: No bags are allowed on tour. All bags can be locked in lockers prior to boarding the helicopter. Guests should come prepared with warm clothing, including waterproof outer shell , gloves, hat, sunglasses, camera, and binoculars. Comfortable walking shoes are recommended. Prohibited items - iPads or any type of tablets, selfie-sticks or any other extending electronic device. Get away from the crowds, and enjoy the adventure of a lifetime by air, water, and ice in the Alaskan wilderness. Your van driver will pick you up at the pier, and take you to a private heli-base across the Gastineau Channel. At the base, you’ll be given a pre-flight safety briefing, and store your bags and other larger personal items. Aboard the helicopter, you’ll fly high above Juneau, the Tongass National forest, the Juneau Ice Field, Gastineau Channel, and Taku River, all the way to Taku Point. After landing at a remote location at Taku Point, you'll have a photo opportunity, gear up in flotation equipment, and receive a safety briefing. Next you’ll descend 2 flights of stairs to the airboats below. The airboat captain will help you board the covered airboat, and your adventure continues by water as you cruise the 5-mile terminus of the only advancing glacier of the Juneau Ice Field. You’ll come within arm’s reach of the ice, and you’ll understand the immense size of this glacier as you stare up at it from the river. The airboat captain will stop the boat in various locations for photos, and to talk about the glacier and the river basin that it has carved out over the years. Back at Taku Point, you’ll head back up the stairs, and again board the helicopter that will take you up to the top of the Taku Glacier. Step out onto the amazing 4500’ thick ice, for a 10-minute glacier landing. You’ll have time for more photos, and your pilot will give you details about the ice field, and facts specific to the Taku Glacier. The helicopter will then return you to the heli-base, and the van will return you to your pier. Please note: Bring your camera, sunglasses and water bottle. Wear warm layers including hats, gloves and closed-toed shoes. No bags, selfie sticks or ipads are allowed on the aircraft. Minimum age is 7 years old. Due to flight weight and balance limitations, as well as passenger safety and comfort, passengers weighing 250 pounds or more will be charged an additional half fare to reserve adequate space on board the helicopter. Have you ever envisioned living the life of a Research Scientist? Or looking for the thrill of encountering one of the earth’s largest creatures? Well, now’s your chance! Alaska’s waters hold one of the largest concentrations of humpback whales and along with your contribution to ongoing research during this exhilarating excursion you are guaranteed to see a whale! Not only is this a one-of-a-kind whale watching experience, but you’ll will have the opportunity to participate in various science activities aboard a custom designed vessel permitted to collect research data while on the open water. From the pier you’ll travel north to meet your vessel in Auke Bay. Meet your experienced captain and board your wildlife viewing vessel. Have your camera handy as you cruise through the island-studded waters of Stephens Passage, a wonderland of snow-capped peaks and ice-blue glaciers. While you cruise, you’re sure to spot humpbacks, orcas, sea lions, harbor seals, and porpoises. Once a whale is spotted, the Captain will slow down for exceptional viewing and photo opportunities. Given the right behavior and weather conditions, you may hear the haunting, moaning call of the humpback. Luckily, the vessel is equipped with a hydrophone when the opportunity arises, to listen to the underwater sounds of whales while an onboard naturalist explains the habits and habitats of the creatures you may encounter. When conditions permit during your cruise, you’ll explore the foundation of the food chain by drawing plankton samples, take a look at live sea animals in a touch tank and even use a GPS camera to aid in identifying specific whales while recording their varied behaviors. Please note: There is a variable sloped ramp leading to the safari vessel dock which changes with the tide. Whale sightings are frequent. All guests must sign a waiver attesting to their physical and medical conditions to participate. Dress warmly in layers, as the tour operates in all weather conditions. Bottled water and a snack pack are included. Bring a camera with plenty of film or memory and batteries. Participants are eligible to enter to win cash prizes in the tour operator's Capture Juneau Photo Contest. Learn what it takes to be a musher in the great Alaskan dog sled races with a trip to a sled dog summer camp. As you arrive at the summer camp training site, you will be greeted by a professional dog musher and some of the state's most famous athletes- the Alaskan Huskies! After an educational tour of the camp, you'll visit a replica of an Iditarod checkpoint and go through the steps each musher performs, step-by-step, as if you’re traveling along the Iditarod trail. Next, climb aboard a comfortable wheeled sled and relax as your husky team whisks you along the 1.5-mile trail through the beautiful landscape. You'll return to camp for your chance to visit with the dogs and meet the next generation of great Alaskan athletes - sled dog puppies! Please note: Dress in layers and bring a waterproof outer layer. There will be a coffee/tea break with cookies. minutes aloft, touch down for this unique glacier experience, as your guide will lead you on a 2-hour trekking adventure. No experience is necessary and your guide will teach you the proper use of the mountaineering gear so that you can access and explore some of the glacier's remote areas. Your trek is interspersed with detailed explanations of the glacier environment and surrounding area. At the end of your hike, your helicopter awaits to lift-off for the 10-minute flight back to the heliport. passengers weighing 250 pounds or more will be charged an additional half fare to reserve adequate space on board the helicopter. Discover the diversity of the Southeast Alaska landscape via helicopter as you fly over the temperate rainforests and granite peaks that surround the Juneau Icefield, then land on a glacier for a walkabout putting the grandeur of the glacier at your feet. Begin your adventure with a short van transfer from the ship to the heliport for the flight to the glacier. Your pilot will choose a landing site on one of the 36 glaciers of this 1,500 square-mile ice field. On this non-strenuous, 1-hour interpretive glacier walk, your guide will provide detailed explanations of glacier environments and allow ample time for photo opportunities. Rain and wind proof outerwear, hard-shell mountaineering boots, and gloves are provided for your comfort while on the ice. Trekking poles and crampons will provide superb balance and traction, enabling you to travel easily on the gently rolling glacial terrain. Re-board your helicopter for the 10-minute flight back to the heliport to de-gear. The van then returns you to the pier. Please note: This tour requires a moderate amount of exertion during the 1-hour walk on the glacier's surface. The surface may be very slick and the nature of the terrain varies. This tour is not recommended for guests with limited mobility or those who use a wheelchair. Guests must be a minimum of 8 years of age and sign a waiver attesting to their physical and medical conditions to participate. Guests between 8 and 17 years old must be accompanied by a parent or guardian. Use of IPads, selfie sticks or handheld GoPro mounts is not permitted inside the heli or on the ice while trekking for guests comfort and safety. Flight time is approximately 30 minutes; seating is based on weight and balance of the aircraft. Due to flight weight and balance limitations, as well as passenger safety and comfort, passengers weighing 250 pounds or more will be charged an additional half fare to reserve adequate space on board the helicopter. Rain and windproof jackets and pants, boots with crampons, trekking poles, and gloves are provided. Dress in warm layers and wear mid-calf length socks and sunglasses. Take in all of the beauty Southeast Alaska has to offer on this once-in-a-lifetime helicopter tour to the Mendenhall Glacier. Your tour will begin with a short transfer to the heli-base. Here you will be geared up with glacier boots and given a safety briefing by the friendly and attentive tour attendants. Load up into the state-of-the-art helicopters and begin your bucket-list-worthy adventure. Highly-trained pilots will lift you off the ground and safely transport you over some of the most breathtaking sights you have ever seen. Lush green rainforests, alpine ridges, and glacier valleys pass beneath you as you make your way to the main attraction - the famous Mendenhall Glacier. Before touching down, you will have a birds-eye-view of the awe-inspiring blue glacier ice, deep crevasses, spectacular ice falls and the jagged peaks of the Mendenhall Towers. Once you have safely landed on the glacier you will be in the hands of expert glacier guides. These knowledgeable guides will take you on a tour of the frozen river of ice they consider their backyard. During your tour you will learn how glaciers are formed and what makes them so spectacular. The tour will allow you to explore melt-water pools, taste pure glacier water, feel glacier silt, and capture all of the beauty on your camera. The adventure isn’t over yet when you join your pilot to take in the Alaskan beauty from the air one last time. Leaving the glacier behind, you will take with you memories that will last a lifetime. Please note: Although there is no weight limit for this tour there is a surcharge for guests weighing over 250 lbs. with all clothing and gear. The tour is considered moderate and all guests must be able to walk 100 yards on the uneven surface of the ice and pavement at the heli-base. Guests must be able to do the 18-inch step into and out of the helicopter unassisted. Tour attendants will offer a helping hand to steady guests but cannot lift them into the helicopter. Canes, walkers, scooters, or wheelchairs cannot be accommodated on the helicopter ramp, in the helicopter or on the glacier. A walking stick or chair can be provided on the glacier for those needing more assistance. No bags are allowed on tour. All bags can be locked in lockers prior to boarding the helicopter. Guests should come prepared with warm clothing, including water proof outer shell and bring gloves, hat, sunglasses, camera, and binoculars. Comfortable walking shoes are recommended. Prohibited items include iPads or any type of tablets, selfie-sticks or any other extending electronic device. Since a seaplane provides the only access to Alaska’s famous Taku Glacier Lodge, this tour will combine classic powerful aircraft, true wilderness, 5 massive glaciers, bears, vivid history with dog sledding roots, seafood and exclusive glacier view dining! You will board a classic De Havilland seaplane and ascend over 5 breathtaking glaciers within the Juneau Icefield, surrounded by the lush Tongass National Forest. Seeing glaciers from the air is an Alaskan MUST DO, and doing so by Alaskan bush plane is the quintessential Alaskan experience! You will land on the Taku River at the elegantly rustic and historic Taku Lodge, built in 1923 and located across from the 5-mile wide Taku Glacier, Juneau’s largest glacier. Savor a menu of fresh Wild Alaskan Salmon, (chicken alternative), and scrumptious side dishes, all made from scratch. The feast attracts visitors, but also wild black bears. All participants will enjoy a window seat and headset of continuous narration. You can do it all in this exceptional combination tour of Alaska’s premier attractions! Please note: Wear comfortable walking shoes, dress in layers, bring sunglasses and of course a camera! Menu includes Wild Alaskan Salmon cooked over an outdoor alderwood fire, (chicken as an alternative), special slow-cooked baked beans, coleslaw, Pioneer fruit compote, Alaskan sourdough bread, savory herb biscuits, and the famous Taku Lodge ginger cookies. Explore Alaska’s capital city in a unique and tasty manner during this 2.5-hour culinary walking experience. Featuring the best in Alaskan cuisine, the tour shares insights into the Alaskan seafood industry, as well as colorful history and fun facts. The tour features the best in Alaskan seafood, including king crab bisque, halibut dumplings, and panko crusted salmon. All locations are owned and operated by true Alaskans, and it's quite common for them to visit with our guests. There are seven delectable tastings, each with a beverage pairing, in addition to sweet treat for you to take with you. The route is just over 1.2 miles and easily walkable, with stops along the way to showcase Alaska's history, fun facts, and of course dine! Please note: Wear comfortable walking shoes and dress in layers, with a waterproof jacket/coat. Depart the pier in a media-equipped shuttle with your naturalist photography guide for a drive to some of Juneau's most photogenic locales. En route, your guide will share handy tips and techniques to enhance your images, along with personal stories and insights about the area's cultural and natural history. You will also view a slideshow depicting personal images and illustrated photography techniques. Upon arrival at the Mendenhall Glacier, you will take a guided walk along a gentle forested trail, take in splendid vistas and many visual opportunities, including wildflowers, beaver activity, cascading waterfalls and spawning salmon (when in season). You will picture breathtaking glacier panoramas and floating icebergs amidst a paradigm of snowcapped peaks. Next, explore the channels and islets of beautiful Stephen's Passage during 2-hour cruise aboard a custom built safari vessel. These are the only crafts of their kind in Southeast Alaska, custom built specifically for marine wildlife photography. Photo opportunities may include blue-hued glacial ice, forest-piercing rays of light, soaring eagles, humpback whales, sea lions, killer whales, black bears and more. Your guide will provide you with photo assistance and quality interpretation throughout the excursion. Please note: This tour requires a moderate amount of walking, approximately .75 miles on a newly surfaced trail. There is a variable sloped ramp leading to the safari vessel dock. This tour is not suitable for those who utilize a wheelchair. Guests must be able to meet the physical requirements of the tour. Whale sightings are frequent. All guests must sign a waiver attesting to their physical and medical conditions to participate. Dress warmly in layers, as the tour operates in all weather conditions; rain gear, walking sticks, camera towels are provided. Bottled water and a snack pack are included. The tour sequence may vary. Bring a camera with plenty of film or memory and batteries. Children 12 years old and younger will receive a complimentary children’s one time use camera. Participants are eligible to enter to win cash prizes in the tour operator's Capture Juneau Photo Contest. Guests will receive a frame-able postcard with instructions to access exclusive online photography tutorials, slideshows, historical images and a printable tip sheet. All content is free and downloadable to any device. Your knowledgeable guide will meet you at the dock in Haines. A scenic 26-mile drive along the National Scenic Byway and through the Chilkat Bald Eagle Preserve will bring you to a remote staging area. At the staging area, you’ll receive an orientation and safety briefing on the Arctic Cat and Kawasaki side-by-side ATVs from your guides. Guests wishing to drive must be at least 21 years old and bring a valid driver's license. There are a combination of 2-person and 4-person machines to accommodate varying group sizes and families. There will be several spots along the tour where you can swap drivers to give everyone some time at the wheel. The ATVs are automatic transmission and drive similar to a car for ease of operation. These high performance ATVs are fun to drive and a great way to explore the Alaska wilderness. Over the next 12 miles of gravel road, your guide will lead you through a series of remote areas, and you’ll explore the wilds of Alaska! As you drive along beaver ponds and mountain meadows you may spot swans, salmon, eagles, bears or moose along the way. You’ll cross over Little Salmon Creek and ascend to a series of viewpoints overlooking the Klehini, Tsirku and Chilkat River Valleys. From your high point, you’ll enjoy a picnic lunch while you bask in the surrounding mountain views. After lunch, descend the mountain and make your way back to the private staging area before returning by bus back to Haines. Please note: Dress in warm, dry layers and wear closed-toed shoes. You will be provided with a helmet, goggles and a rain poncho. Treat yourself to a private rafting and scenic drive through the famous Chilkat Bald Eagle Preserve. Begin with a riverside drive along the Haines Highway. The drive is incredibly scenic: glacier-clad mountains thrust to the sky, colorful wildflowers line the road, green riverside channels provide habitat for moose, bear and trumpeter swans. The highway was declared a National Scenic Byway in 2009. You will arrive at the river in the heart of the Chilkat Bald Eagle Preserve, approximately 40 minutes away. Board your raft and enjoy a scenic float down the Chilkat River through the famous Chilkat Bald Eagle Preserve. You will be immersed in the Alaskan wilderness, floating the silent river. Paddling is not required, as your expert guide will push the raft along, leaving your hands free for your binoculars or camera. Along the way, your guide will interpret the natural history of the area, and share some exciting stories of life in the Alaskan wilderness. You will learn to spot bald eagles and gain an appreciation for the challenges that bald eagles face to survive. Early in the summer, resident eagles are often seen coming and going from their nest to feed their young. As the summer continues and the river fills with salmon, more and more eagles arrive to feed. Please note: Wear comfortable shoes and layered clothing appropriate for the weather. Bring your camera and/or binoculars. You will be provided with a life jacket, rubber boots and a rain poncho if needed. Meet your naturalist guide for a small-group driving tour to scenic and wildlife-rich Chilkoot Lake State Park. This park has it all: a turquoise lake surrounded by snowy mountain peaks, a salmon-filled river flowing into the sea, and important Tlingit cultural sights. Bald eagles, harbor seals, and brown bears are often seen here. As you drive through the park, your guide knows the best places to stop for scenery and the possibility of wildlife spotting. Supplied with extra binoculars and a powerful spotting scope to bring the wildlife in close, your guide will explain how the animals fit into the Chilkoot's complex ecosystem. May, June, and July feature an explosion of wildflowers with bald eagles nesting along the lush river. Beginning in August pink salmon—the smallest and most abundant of the Pacific salmon varieties—begin their run up the Chilkoot River to spawn. This is the best opportunity to see brown bear as they are often witnessed feeding along the banks of the river. Make sure to bring your camera to take advantage of the numerous photo opportunities. Please note: Dress in warm, dry layers and wear closed-toed shoes. Photograph the stunning scenery of the Chilkat Valley. Cradled at the base of the Chilkat Peninsula, flanked by the Lynn Fjord and Chilkat River, Haines is filled with natural wonders. Your expert photography guide will assist you in capturing the best of the Chilkat Valley's unique attractions and will select his/her favorite locations and provide you with ample time to set up to get the best shots. Depending on the lighting and weather, different locations in the Chilkat Valley boast specific photographic highlights. May, June, and July feature wildflowers and bald eagles. Beginning in August, pink salmon begin their run up the Chilkoot River to spawn. This will be the best opportunity to see brown bears as they are often witnessed feeding along the banks of the river. When bears are present, every effort will be made to give you safe bear viewing and photography. The theme is flexibility, fun and learning rather than adherence to a rigid schedule. Even a simple point-and-shoot camera or iPhone will work. Bring all your photo gear; there will be room in the vehicle. Tripods will be supplied. Please note: This tour requires a minimal amount of walking; however, guests must be able to embark/disembark the vehicles via steps. It is not recommended for guests who utilize a wheelchair. Dress in layers, wear comfortable walking shoes, bring rain gear and your camera equipment. Observing bear and other wildlife is the goal but cannot be guaranteed. This tour includes a copy of Where Eagles Gather: The Story of The Alaska Chilkat Bald Eagle Preserve, Haines, Alaska. This scenic journey will begin with an escorted high-speed catamaran ride from Haines, featuring magnificent views of mountains and waterfalls as you cruise through the deepest fjord in North America. You will arrive in Skagway, a town of about 900 tucked into the Alaskan Wilderness. Come see what everyday life is like and experience the marvelous beauty that surrounds it. Once in Skagway, you will board a van and drive through Skagway’s historic district and residential districts. Hear tales about Skagway’s time as a gold rush boom town as your guide points out some of its historic buildings. Driving through Skagway’s residential district you’ll learn all kinds of interesting facts about this wonderful town. Head over a mountain road to what was once the gold rush city of Dyea. Along the way you’ll stop at the Naku Bay overlook and peer down North America’s longest and deepest fjord. Next, head to the trailhead of the Chilkoot Trail. This world-famous trail was the main route to the riches of the Klondike and winds through a lush rainforest alive with birds, animals and wildflowers. After Dyea, make a stop at the Skagway overlook to see this quaint valley from above before you head up the Klondike Highway. Go from sea level to the 3,929’ White Pass Summit in just a few short miles. Enjoy snapping photos of the incredible views along the way. At the summit grab a photo of your group at the tour favorite “Welcome to Alaska” sign and enjoy a picnic lunch. Great views continue as you descend the White Pass en route back to Skagway. After a brief stop at U.S. customs you will arrive back to the ferry terminal and return to Haines. Please note: Passports will be required for all participants, and visa where applicable. Stretch your legs while you learn about the history, Native culture, and present-day lifestyle of the residents of this isolated Alaskan town. Your local guide will show you the highlights of historic Fort William H. Seward, founded in the early 20th century to anchor America's border claims during the turbulent Gold Rush era. Sights include the old barracks buildings, the parade grounds, Soap Suds Alley, and "Officers Row." These buildings overlook the 9-acre parade grounds, Lynn Canal and the Chilkoot Mountains. Your guide will bring you up-to-date on the happenings in Haines and the “Fort.” Continue along the “back trails” to downtown Haines, where you will visit the Hammer Museum. Meet the curator and find out why small, remote Haines is the home of this quirky museum dedicated to man’s first tool. The museum spans history from the Egyptian pyramids to the Space Age. There is something for everyone and you’ll be sure to leave with a smile on your face. Next, you will stop at the Sheldon Museum, which features two galleries full of exhibits on native and non-native settlement of Haines and the Chilkat Valley area, as well as a rotating display of local artwork. Exhibits cover local Tlingit’s exquisitely woven and highly-prized Chilkat Blankets, finely detailed spruce root basketry, and intricate beadwork. Early European exhibits cover the salmon cannery period, and the Gold Rush including the Dalton Trail to the Klondike Gold Fields and the Porcupine Gold Rush. Please note: Wear comfortable shoes and layered clothing appropriate for the weather. You will walk just about a mile. After meeting your guide on the dock, you’ll load up on a bus and start a 22-mile drive through the Chilkat River Valley to the village of Klukwan. The Haines Highway is a designated National Scenic Byway where beautiful vistas abound. After a 40-minute scenic drive through the Chilkat Bald Eagle Preserve, you will arrive in Klukwan, the only remaining village of the Chilkat Tlingit people. Located at the confluence of three rivers, this ancient village has seen a multitude of generations. Their close relationship to the land is revealed through the exhibits in the Jilkaat Kwaan Cultural Heritage & Bald Eagle Preserve Visitor Center. This state-of-the-art, museum-quality center is situated in a stunningly beautiful natural landscape on the northern banks of the Chilkat River. The Heritage Center provides access to ancient art treasures that have previously not been available to the public. The Whale House Collection, uniquely displayed in its place of origin, allows entrance to the Chilkat Tlingit people’s distinctive ethnic landscape. As you tour this world-class facility, you will learn about the depth and complexity of Tlingit society. There will be many amazing experiences during your visit to Klukwan and one of the best things, visitors say, is the people. Before departing Klukwan for your return journey to Haines, you will also have some time to enjoy some locally caught smoked salmon, visit the gift shop where local native arts and crafts can be purchased and use the on-site spotting scopes to watch for eagles fishing for salmon in the Chilkat River. Relax on the drive back, soak in the views and contemplate the rich cultural heritage of a proud and ancient people. Please note: Bring your camera, binoculars and sunglasses if desired. Dress in warm, dry layers, wear flat comfortable shoes and bring extra socks. This wildlife sanctuary sprawls over 60 acres and will provide you an opportunity for some great photos of orphaned Alaskan animals in a natural setting. This is a once-in-a-lifetime opportunity to see wild animals as they live out the rest of their lives in their natural habitat. Steve is their caregiver and talks to the animals like a real Alaskan Dr. Doolittle. Steve was born and raised on a farm in Northern Minnesota and worked with wild, orphaned animals since he was a toddler. From grade school on, he did animal presentations for the public and later, on national television. As an adult, Steve started working with wild animals in the motion picture industry and his first filmwork was with wolves on Walt Disney's Never Cry Wolf in 1981. Later he started making his own wildlife movies and works on documentaries for National Geographic, and many others which continue to this day. Please note: Wildlife sightings are guaranteed. This tour is NOT recommended for guests with walking issues or who have trouble walking up steep inclines. No collapsible wheelchairs and no electric scooters. Okay to bring your camera or video equipment. Wear comfortable shoes, bring a jacket, and wear layered clothing. Haines, Alaska was recently chosen by Outside Magazine as one of America’s top 10 locations to live and play. This tour, hosted by a knowledgeable local resident, gives you an insider’s look at what makes Haines so special. Your tour will begin with a guided visit to one of the most unusual attractions in all of Alaska -- the Hammer Museum. Meet the curator and find out why remote Haines has the only museum in the world dedicated to this under-appreciated household tool. Continue with a 10-mile scenic drive along the Chilkat River. Drop down to the seaside for a fantastic view across the inlet to Rainbow Glacier -- a hanging glacier with an immense waterfall pouring from its face. Next, visit the small artists’ enclave of Mud Bay and the Extreme Dreams Art Studio, owned by local artists John and Sharon Svenson. Their handcrafted timber-frame gallery is filled with unique creations by select local artisans. The tour will also include a visit to Haines downtown area and "Picture Point" - a scenic vantage point featuring iconic views of Haines and historic Fort Seward with the gleaming Chilkat Mountains in the background. The view also encompasses the snow-capped Coast Range Mountains lining the Lynn Canal, which is the longest and deepest fjord in North America. This homespun tour is sure to leave you with a smile on your face. Please note: Minimal walking is required. Wear comfortable shoes and layered clothing appropriate for the weather. Cameras and binoculars are optional. Your adventure will begin with an escorted high-speed catamaran ride from Haines to Skagway, featuring magnificent views of mountains and waterfalls as you cruise through the deepest fjord in North America. Once in Skagway, relax and enjoy a 20-minute narrated coach tour of historic downtown Skagway as you head north on the Klondike Highway. A short walk on a rainforest trail will bring you to a spectacular adventure park, where expert guides will outfit you with safety equipment. Listen to some instructions; then you’re off to enjoy the thrill of the ropes course and zipline experience. The ropes course will include Burma loops, a suspended bridge, and raised balance beam. Next up will be a fantastic series of six ziplines through the lush Alaska forest canopy. As you zip from platform to platform, fellow participants cheer you on. The adrenalin will be pumping as you prepare for the final segment, soaring high above the ground through the treetops. You’ll have approximately 2½ hours to enjoy this adventure location. Enjoy a snack of hot cocoa, coffee and trail mix before heading back to Skagway. Your driver will take you to the ferry terminal for your trip back to Haines, or, if time permits, you may choose to have your driver drop you in downtown Skagway to spend a few minutes exploring before you head to the ferry terminal. Relive your exciting adventure as the catamaran glides back to Haines. Please note: Stable closed-toe shoes required. Dress in layers, bring rain gear. The White Pass Railroad offers a unique 40-mile vintage train ride that climbs from Skagway to the summit of White Pass with an elevation of 2,865 feet. You will begin your journey with a 30-45 minute boat ride via fast ferry from Haines to Skagway. Once in Skagway you’ll begin your experience onboard one of the yellow 1927 sightseeing buses belonging to the “oldest sightseeing company in Alaska.” Founded in 1923 by former Klondike stampeder, Martin Itjen, your costumed conductor passes on a century of Skagway history, behind the scenes tales, and stories of life in small town Alaska. You’ll explore the waterfront, National Park Historic District and Skagway’s residential area, famous for its flower gardens. Arriving at the railway depot, you’ll board a vintage railcar for your trip aboard the world famous White Pass & Yukon Railroad, retracing the original route of the Klondike Stampeders while enjoying a breathtaking panorama of mountains, glaciers, and waterfalls. This narrow-gauge railroad is an International Historic Civil Engineering Landmark. It shares this honor with the Panama Canal, the Eiffel Tower and the Statue of Liberty, and is truly a world wonder. Upon arrival at Fraser, B.C., you’ll travel back to Skagway via the Klondike Highway by mini-bus. There will be plenty of photo stops along the way. Please note: Wear comfortable walking shoes and bring your original passport, camera, and binoculars.Duration of the entire tour is approximately 6 hours – this includes the transfer time on the fast ferry, which is approximately 30-45 minutes. Tour may run in reverse order. Enjoy the peace and quiet of the true Alaskan Wilderness as you travel about 25 miles of the Chilkat River System, exploring the different channels that this unique, braided river system offers. Watch for wildlife as they are frequently sighted during the river tour. The flat bottom river boats are designed specifically to traverse the narrow and sometimes shallow, channels, which is the only way to explore this road-less portion of the Bald Eagle Preserve. This tour is well known for moose and bear sightings, although not a guarantee, wildlife sightings are quite frequent. The tour will take off from private property, so all the amenities are available for you to feel comfortable and right at home while the friendly staff will prepare your meal. Sit around the crackling fire and enjoy the clean fresh air and beauty that surrounds you. You will come away with a greater appreciation of the wilderness and the people who call this "last frontier" their home. Your tour will begin at the pier where your ship is docked, with a 30-minute bus ride into the heart of the Bald Eagle Preserve on the Haines Scenic Byway. Where the road ends, your adventure begins. Please note: Wear comfortable hiking shoes and layered clothing appropriate for the weather. Bring your camera and/or binoculars. Life jackets will be provided. The boats are open air so ponchos and waterproof blankets will be provided. Please note: You can conveniently change in your suite. Dress according to the prevailing weather conditions; you will be provided with a life jacket. Wildlife sightings are not guaranteed and tour operation is weather dependent. 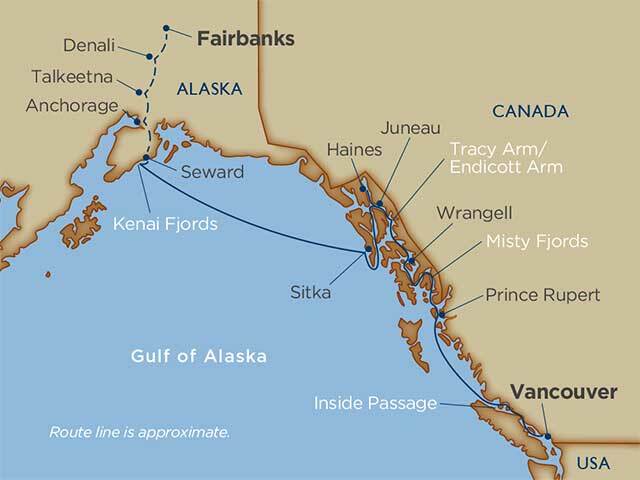 The decision to go to Tracy Arm or Endicott Arm will be decided the day of the excursion by the Captain and Expedition Leader, it will be made based on the prevailing ice conditions, weather and other cruise ship traffic in the area. Both locations allow for similar sightseeing opportunities. Expedition Voyage Consultants may include geologists, marine biologists, botanists, and glaciologists. You will be paddling for about 2 hours. Please note: You can conveniently change in your suite. Dress according to the prevailing weather conditions; you will be provided with a life jacket. Wildlife sightings are not guaranteed and tour operation is weather dependent. The decision to go to Tracy Arm or Endicott Arm will be decided the day of the excursion by the Captain and Expedition Leader, it will be made based on the prevailing ice conditions, weather and other cruise ship traffic in the area. Both locations allow for similar sightseeing opportunities. Expedition Voyage Consultants may include geologists, marine biologists, botanists, and glaciologists. Discover the highlights of this truly Alaskan town and see its colorful history and native culture come to life while visiting the Wrangell Museum and Petroglyph Beach with Kiks Adi Totem Park and Alaskan Native interpretation. You will depart from the pier and walk to downtown Wrangell and Kiks Adi Totem Park. Here, interpretive narration will be provided by local natives. Then, learn about the Stikine River and its significant influence on the development of Wrangell. Your walk through the town will show you its historic churches and a glimpse of a traditional Tlingit Tribal House. Then you will visit Wrangell's famous anthropological sight, Petroglyph Beach with rock carvings dated 8,000 years before the settlement by the Tlingit tribes. Enjoy a petroglyph rubbing demonstration before heading to the Wrangell Museum that houses a rich assortment of over 5,000 historic photos, native artifacts, a collection of Tlingit petroglyphs, and fishing, mining and logging displays. Afterwards, you can make your way back to the ship with the provided transportation offered by your guide, or you may choose to stay longer in Wrangell and do the short walk on your own. Please note: The order of sites may vary. Walking is required to and from the sites, especially Petroglyph Beach. Petroglyph Beach is a natural beach with rocks, gravel, sand and logs that can be slippery at low tide. Guests may wish to enjoy additional city highlights on their own before returning to the ship. Wear comfortable walking shoes. There are several steps to the Petroglyph Beach, not suitable for those in wheelchairs. Walkers or canes can do this tour. The Stikine River is considered one of the last truly wild rivers in North America, running directly through the nearly ½ million acre Stikine LeConte’ Wilderness area. Immerse yourself in the pristine wilderness of the world's largest temperate rainforest that is home to a variety of wildlife species and though elusive, you may have a chance of sighting. Add the excitement of an exhilarating jet-boat ride, gold rush history, world renowned scenery, and the most experienced energetic captains, and you have a great excursion. On the pier, you will meet captain and interpretive guide and embark on the custom-built, heated and covered, jet boat to begin your adventure. Traverse the ever changing river delta, meander through side sloughs and explore the banks of the river. Seek out views of distant mountain peaks, spy on spawning salmon and listen to thundering waterfalls. Your journey will culminate at Shakes Lake with its sparkling blue, crystal clear icebergs. If accessible, you will venture in farther for a view of Shakes Glacier and the ancient ice from which it was created. If conditions allow, come ashore at a wilderness location on the banks of the Stikine and experience the wilderness up close. Please note: The tour routing and sights may change due to weather, nature and water conditions. Due to the nature of boating in the wilderness on the Stikine River, which sometimes requires travel in shallow water, you may experience quick or sudden stops, starts and turns while underway. Guests should be in good physical health with a full range of motion to get into/out of the vessel and have no motion-related ailments or any other health issues. This tour is not wheelchair or handicapped accessible. This tour departs and returns from the Wrangell city dock, which is a short walking distance (300 ft) from the ship. At certain tidal conditions the access ramp to the vessels can be very steep. Facilities are basic in the wilderness location and consist primarily of USFS outhouses. Although wildlife is seen on many outings, sightings cannot be guaranteed. Here’s an opportunity to experience world-class fishing in the abundant waters of the Pacific Ocean along the famed Inside Passage of Alaska. See spectacular scenery and protected nearby calm waters while fishing for a multitude of sought after species including, salmon and halibut. You will fish “Captain’s Choice” for the best chance to catch based on what “fishy” news the Captain has been hearing and partly, depending on the season. A major difference with fishing in this area is the normally short distance to the fishing grounds. A quick boat ride will ensure that you will spend most of your time actually fishing rather than just getting there. Adventure awaits you the minute you arrive! Your experienced, licensed captain and guide will greet you as you disembark the ship and see to your needs whether you are a seasoned angler or experiencing this renowned fishing for the first time. Your catch can be professionally processed and shipped to your home for an additional fee. The purchase of fishing licenses and tags on board is available for your convenience and to optimize your fishing time. Beverages are available on board. Fishing gear, tackle and bait are provided. Bring home a fishing memory that will last a lifetime. Please note: Wear comfortable, sturdy shoes and be prepared to get wet if landing a fish. The ramp to and from the boat may be steep depending on tidal conditions. Guests must purchase a Fishing License at the dock. The license is $40 per person, must be paid for in cash and guests must have ID with them. Journey through the past to the present on a personalized tour experience of Wrangell and its most popular attractions. Your Alaskan Native guide will share the diverse history of Wrangell starting with the first inhabitants, the Tlingit Nation, whose history spans approximately 10,000 years. Sit down as invited guests at Chief Shakes Tribal House to hear stories that have been with us; passed down generation to generation. Learn the story of Fort Wrangell, unearth ancient petroglyphs and explore Wrangell today (from the comfort of your shuttle). Bottled water and a souvenir petroglyph rubbing will be available for you. Three great sites will be visited: Chief Shakes Tribal House, the Wrangell Museum and Petroglyph Beach. Several historic sites are viewed from the shuttle as part of the driving portion of this tour. The tour will depart from and return to your pier. As the third oldest city in Alaska, ruled by four nations, under three flags, Wrangell’s rich and diverse history is sure to captivate you! Please note: This is a walking and driving tour. Much time will be spent on your feet at Petroglyph Beach and the Wrangell Museum. Wear comfortable walking shoes and weather appropriate attire. You will be transported by shuttle bus to each of the sites. All sites are handicap accessible, although not able to accommodate wheelchairs. Anan Bear and Wildlife Observatory - a natural adventure in bear viewing! Travel by covered, heated boats the 35 miles to Anan via Eastern Passage, a beautiful boat ride in protected waters between Wrangell Island and the mainland. Arriving at Anan you will offload at the trailhead and be greeted by US Forest Service personnel, who will provide a brief orientation. Beginning in July, pink salmon arrive at Anan creek to spawn. At this time, Anan creek is teaming with salmon which naturally attracts brown and black bears, bald eagles and harbor seals. Your guide will interpret local flora and fauna along the trail and watch for bears. Every day is different, we are in nature and things happen in a natural way. Along the trail there is the Lagoon Overlook Platform. This is an ideal spot to see bears foraging when in season. At the top of the trail, lies the Creek Overlook, a large platform that sits on a hill overlooking the falls of Anan creek. This is often where the bears fish for the spawning salmon as they fight upstream to the calmer pools of the spawning grounds. The walk in to the Observatory takes about 20 minutes and is about ¾- mile long. Though the trail is improved and groomed in places, the upper portion still has narrow (2 ft. wide) boardwalk with several sets of narrow stairs (total of over 300 stairs) with bridges over waterways. There are only a few places that have handrails. Guests need to be in good physical conditions with no difficulties walking as several portions of the trail are natural and involve stepping over roots. Conditions change with weather and it can be slippery. You will have 2 hours to observe the wildlife before heading back. Please note: Dress for the weather of the day and sturdy, water resistant walking shoes are a must on this trip. Guests must be able to get into and out of the boats, which require large steps over side of dock and in the vessels. Total walking distance will be 1-1.5 miles. No food is allowed at Anan, not even gum unless the participant is a diabetic and requires food on hand. Conditions change with weather and it can be slippery. There is no dock at the trail head – you will disembark on rocky shoreline and tide level changes conditions. All of the guides are local Wrangell, Alaska residents with extensive wilderness experience. John Muir hiked here while using Wrangell as headquarters for his Stikine delta explorations. Participants are assured of wonderful views and a true immersive forest experience with an elevation gain of about 400 feet. This hike will present good views of the surrounding mountains and landscapes and a chance to learn about rainforest ecology. This intimate interpretive tour will be led by two of our experienced onboard Expedition Staff. Please note: This excursion will depart directly from the ship and will be led by two Expedition Staff. No equipment is required. Guests will need to wear their own suitable footwear and dress according to the prevailing weather conditions. Expedition Voyage Consultants may include geologists, marine biologists, botanists, and glaciologists. The departure time for this tour is subject to change due to the nature of the excursion. Destination Services will notify you about your tour departure time. The walk is mostly on boardwalk which does not have handrails, can become slippery when wet and has approximately 300 steps to the summit of Mount Dewey. This tour is not recommended for those with walking or mobility issues. Windstar Signature Expeditions are operated by Windstar Cruises directly from the ship. Windstar has partnered with Expert Expedition Voyage Consultants to provide insight, education and commentary on the stunning scenery of the Alaskan Wilderness. On your 2.5-hour kayak expedition through Misty Fjords National Monument you will see 3,000-foot glacier-sculpted cliffs with numerous waterfalls cascading down the cliffs, wildlife like bald eagles, and perhaps brown and/or black bears and mountain goats. Throughout the forest you will find western hemlock, Sitka spruce and western red cedar. Please note: You can conveniently change in your suite. Dress according to the prevailing weather condition; you will be provided with a life jacket. Wildlife sightings are not guaranteed and tour operation is weather dependent. Expedition Voyage Consultants may include geologists, marine biologists, botanists, and glaciologists. You will be paddling for about 2 hours. Windstar Signature Expeditions are operated by Windstar Cruises directly from the ship. Windstar has partnered with Expert Expedition Voyage Consultants who will operate the Zodiac boats while also providing insight, education and commentary on the stunning scenery of the Alaskan Wilderness. On your Zodiac expedition through Misty Fjords National Monument you will see 3,000-foot glacier-sculpted cliffs with numerous waterfalls cascading down the cliffs, wildlife like bald eagles, and perhaps brown and/or black bears and mountain goats. Throughout the forest you will find western hemlock, Sitka spruce and western red cedar. Please note: You can conveniently change in your suite. Dress according to the prevailing weather condition; you will be provided with a life jacket. Wildlife sightings are not guaranteed and tour operation is weather dependent. Expedition Voyage Consultants may include geologists, marine biologists, botanists, and glaciologists. •	Please inform the Destination Services team if you are travelling in a group of 4-6 people and booked on the same expedition as the zodiac boat tours can only accommodate 6 guests at a time. Begin your journey with a brief transfer aboard an air-conditioned motor coach from the Northland Cruise Terminal. Along the way, your guide will offer insight into the history of Prince Rupert and the surrounding communities. Upon arrival, embark on your hike deep into the rainforest while learning of the various plants and trees, their importance in traditional native medicines and culture, as well as their role in the food chain. Approximately halfway through the hike, you will rest at a viewpoint overlooking the Butze Rapids, a great stop for a picture to remember the moment. The unique tidal rapids reverse direction with the tides; peaceful at high and low tides, roaring with white foam while the ocean tide is flowing. Enjoy homemade granola bars and bottled water at the rapids before returning to downtown Prince Rupert. Upon completion of your hike, you will board your ship. Please note: Wear closed-toe walking shoes and comfortable clothing, bring a rain jacket, sunscreen, and insect repellent. Fly high above the pristine northern coastline via floatplane and truly appreciate the awe-inspiring scenery of beautiful British Columbia. Only a short drive from the ship is the Seal Cove Seaplane Base, where you will board your aircraft for a journey that will take you over some of the most mesmerizing sights in the Prince Rupert area. Your pilot will be your guide to remote destinations that include the wilderness of the Khutzeymateen Valley, home to the largest population of grizzly bears in the world. You will want to have your camera ready to capture the magnificent scenery of lush rainforest, deep valleys, rugged mountain fjords, spectacular glaciers, cascading waterfalls, winding rivers and remote freshwater lakes. From this bird's-eye view there is also a chance to view wildlife such as eagles, mountain goats, seals, porpoises or whales. Before returning you to solid ground, your flight will set down in a majestic inlet where you will float alongside a glacial waterfall as it plunges into the freshwater lake beside you. Arriving safely back at your ship, you'll agree that this flightseeing adventure is the airborne experience of a lifetime. Please note: Although some walking is required, it is not excessive. This excursion is not recommended for guest with physical limitations as they will be required to maneuver steps and gaps to embark and disembark the aircraft. Passengers must be able to climb in and out of the aircraft. Height restrictions for this adventure can exceed no more than 6’4’’, as well as a limit of 265 pounds. Cool temperatures can be anticipated, so it is recommended that guests carry a light jacket or sweater. Sunglasses are recommended as strong glares may be expected during your flight. The operation of this excursion is dependent on prevailing weather conditions. Wildlife sightings are not guaranteed. The order of sights visited may vary. Explore the important role of the Feast and performance art in the Northwest Coast culture in this unique tour, combining a museum visit and a real life Feast experience. First learn about the significance of the Feast in a tour of the museum’s galleries with knowledgeable museum guides. Discover ceremonial regalia, beautifully carved headdresses, and the famous Raven rattles used only by the chiefs. Then enjoy a change of pace with a narrated slide show in the Museum’s media room. View exquisite images of the coastal landscape - from rainforest to alpine meadow to offshore islands - and the plants, wildlife, and sea life that populate these ecosystems. At the same time, learn about the intimate relationship between Northwest Coast peoples and their environment. They used everything in a sustainable way: puffin beaks (shed every spring) for dance apron tinklers, mountain goat wool, spun with twined cedar bark to make their magnificent ceremonial robes, and the rich seafoods of the coast, and salmon of the Skeena River, that were the mainstay of their diet. Finally see everything you have discovered come to life when you take a short walk to the Wiiwaabm Ts’msyeen, the Tsimshian Longhouse. Here you will be greeted as a guest in time-honored Northwest Coast tradition and formally seated. The Gwis’amiilgigohl Dancers in full ceremonial regalia will entertain and delight as they dramatize ancient stories with songs and mask dancing. After a parting gift and song, there will be an opportunity for questions and photos. Please note: Bring local currency for gift shop and other items available at the museum. Wear comfortable clothing and shoes for the tour. Bring your camera for photography of the exhibits. You will board your motor coach at port to see the exciting sights of Vancouver, a sophisticated, fun-loving city that celebrates the great outdoors, cherishes its history and diverse cultures, and was home to the 2010 Winter Olympic Games. Vancouver boasts one of North America’s oldest and largest Chinatowns and your tour will take you through its colorful streets. Through the "Millennium Gate" you’ll find a world that is still steeped in tradition and Chinese culture. Asian architecture can be seen around every corner and the alleys teem with restaurants, import shops and exotic delights. Continue on to Vancouver’s Gastown District, a refreshing mix of old and new with cobbled streets, quaint courtyards and Victorian-style buildings. No tour of Vancouver would be complete without viewing world-famous Stanley Park. One of the largest urban parks in Canada, this spectacular spot in the heart of the city is actually a rainforest, teeming with wildlife, magnificent trees and fragrant blossoms. Within the Park are West Coast Native Totem Poles, elaborately decorated with symbolic images and faces. Your knowledgeable guide will explain the legend and history of these magnificent works of art. From the Prospect Point Lookout, Stanley Park's highest point, you will see spectacular panoramic views of the North Shore Mountains, the Lions Gate Bridge and the Burrard Inlet. You will discover the popular English Bay Beach, the area’s premier waterfront destination on your way to the airport. Please note: Have your camera ready, wear comfortable walking shoes and bring bottled water. You will board your motor coach at port to see the exciting sights of Vancouver, a sophisticated, fun-loving city that celebrates the great outdoors, cherishes its history and diverse cultures, and was home to the 2010 Winter Olympic Games. Vancouver boasts one of North America’s oldest and largest Chinatowns and your tour will take you through its colorful streets. Through the "Millennium Gate" you’ll find a world that is still steeped in tradition and Chinese culture. Asian architecture can be seen around every corner and the alleys teem with restaurants, import shops and exotic delights. Continue on to Vancouver’s Gastown District, a refreshing mix of old and new with cobbled streets, quaint courtyards and Victorian-style buildings. No tour of Vancouver would be complete without viewing world-famous Stanley Park. One of the largest urban parks in Canada, this spectacular spot in the heart of the city is actually a rainforest, teeming with wildlife, magnificent trees and fragrant blossoms. Within the Park are West Coast Native Totem Poles, elaborately decorated with symbolic images and faces. Your knowledgeable guide will explain the legend and history of these magnificent works of art. From the Prospect Point Lookout, Stanley Park's highest point, you will see spectacular panoramic views of the North Shore Mountains, the Lions Gate Bridge and the Burrard Inlet. You will discover the popular English Bay Beach, the area’s premier waterfront destination on your way to the Sheraton Wall Center. Photographers, nature enthusiasts and adventurers alike will thrill to this exploration of Vancouver’s picture postcard scenery. The excitement will begin as you board your air-conditioned coach at the pier and head north out of Vancouver and up along the famed Sea to Sky Highway. Sit back and relax as mile after scenic mile passes by your window. A dramatic landscape of old-growth forest, coastal mountains and ocean will greet you as you steadily climb from sea level to over 2,290 feet. Then, you’ll disembark and step inside the gondola cabin, which travels up to a viewpoint 2,903 feet above sea level. The 8-minute ride to the summit provides sweeping views of Howe Sound, the majestic coastal forest and surrounding mountains. You will have about 2-2.5 hours of free time to enjoy all outdoor adventures such as hiking and interpretive walks. Or if you’re feeling even more daring be sure to check out the “Sky Pilot Suspension Bridge,” at 328 feet long, the bridge offers amazing views. You can stroll over to the Summit Lodge and relax and soak up the views from the viewing deck, a sprawling 5,000-square-foot deck that offers breathtaking views of the famous Co-Pilot and Sky Pilot mountain peaks. Or, you can end your perfect day with an enjoyable self-serve dinner inside the lodge at your own expense. This tour will end at the airport. Please note: Be sure to wear comfortable walking shoes and don’t forget the camera - this outing will provide camera buffs with one jaw-dropping photo opportunity after another. Photographers, nature enthusiasts and adventurers alike will thrill to this exploration of Vancouver’s picture postcard scenery. The excitement will begin as you board your air-conditioned coach at the pier and head north out of Vancouver and up along the famed Sea to Sky Highway. Sit back and relax as mile after scenic mile passes by your window. A dramatic landscape of old-growth forest, coastal mountains and ocean will greet you as you steadily climb from sea level to over 2,290 feet. Then, you’ll disembark and step inside the gondola cabin, which travels up to a viewpoint 2,903 feet above sea level. The 8-minute ride to the summit provides sweeping views of Howe Sound, the majestic coastal forest and surrounding mountains. You will have about 3 hours of free time to enjoy all outdoor adventures such as hiking and interpretive walks. Or if you’re feeling even more daring be sure to check out the “Sky Pilot Suspension Bridge,” at 328 feet long, the bridge offers amazing views. You can stroll over to the Summit Lodge and relax and soak up the views from the viewing deck, a sprawling 5,000-square-foot deck that offers breathtaking views of the famous Co-Pilot and Sky Pilot mountain peaks. Or, you can end your perfect day with an enjoyable self-serve dinner inside the lodge at your own expense. This tour will end at the Sheraton Wall Center.